Amity, a lovely word meaning harmony and good feeling. The 1975 movie JAWS! was set on a New England island named Amity where the summer tourists provided lunch for a marauding great white shark. Local Police Chief Martin Brody (Roy Scheider) tried to warn them but Mayor Larry Vaughn (Murray Hamilton) overruled him. In this article, Gentle Reader, you may think of me as the police chief and Peg as the mayor. Peg’s Wal-Mart aboveground pool will serve as our beach. Just take a look at the photograph! That dark goo in the bottom of the pool is as scary as the shark. You will note Peg is covered from head to toe with HAZMAT protection. You may wonder why she is in the middle of the crud while I am not. Well, someone had to take the photograph and I can’t do everything. Peg’s pool brings back memories of my “quality time” with my father. Dad liked to fish but he didn’t like to tote all his equipment to the brown, stagnant Oklahoma creek which housed various critters and a few finned and slimy bass. Before each trip Mom would warn us of the dangers of typhoid fever as she knew Dad would take my brothers and me to the creek without anything to drink. Dad would point to the brackish creek water if the 110° Oklahoma summer drove us past Mom’s cautionary admonishments. Dad and Peg have similar make-ups. 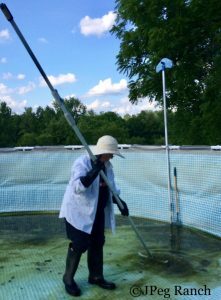 When Peg dragged me away from my Saturday morning coffee to help clean the pool I told her about the recent E. coli outbreaks in Pennsylvania, Idaho and California. She responded that the only thing I had to fear from the pool gunk was her if I didn’t get off my couch. How quickly she has forgotten our experience when the National Judicial College sent me to Russia to teach judges there. We could not brush our teeth, drink or even bathe in much of the water. When I reminded her of this she said, “The ten pounds you lost from the bacteria in Russia was just a start on what you need.” Unkind, very unkind. James Mattis is President-Elect Trump’s choice for Secretary of Defense. According to former Secretary of Defense William Cohen, Mattis is a student of history who understands the dangers of Thucydides’ Trap. Thucydides (471 – 400 B.C.) was an Athenian historian who lived through the Peloponnesian War (431 – 404 B.C. ), which exhausted both the loser, Athens, and the eventual winner, Sparta. This thirty years of internecine carnage sowed the seeds of Greece’s vulnerability to Roman conquest. Thucydides observed it was the rise of the upstart Athenians and the fear and resentment of that rise in the more powerful Spartans that led to war. Archidamus, the Spartan king, had cautioned his citizens to not be hurried into conflict out of any sense of offended honor or an attitude of superiority. However, hotter heads prevailed. The United States is unquestionably the strongest nation on Earth militarily and economically. We may have the power to dictate terms to most other countries. We are the Sparta of our time. On the other hand, we may wish to learn from history, not repeat it. If Russia attempted to influence our elections, we should address this serious issue with all due diligence. Due diligence is not a euphemism for dueling. If China builds artificial islands in international waters and declares them China, we need not make a bellicose response. Maybe negotiation from strength might be better. If the United Nations Security Council passes a unanimous resolution that calls for Israel to follow international law, due diligence does not require that Congress withhold funds from the United Nations unless Israel gets a retraction. Now that Secretary Clinton and President-Elect Trump have ended their election cycle neither they nor their supporters should precipitate a Pyrrhic Victory for our country by continuing to attempt to delegitimize their opponents or their opponents’ positions by the technique of circular firing squads. Perhaps it is time to once more look to the wisdom of some of those marvelous ancient Greeks and even our own President Lincoln and not let a misguided sense of offended honor or an overestimation of our own righteousness lead us to another long series of self-destructive attitudes and actions. Former presidential candidate Hillary Clinton accused Russia of attempting to influence the election via hacking into unflattering emails. She, John McCain, CNN and virtually everyone on the planet but former presidential candidate Donald Trump cited the conclusions of seventeen intelligence agencies to support the accusations. Seventeen! They are: Air Force Intelligence Agency, Army Intelligence Agency, Navy Intelligence Agency, Marine Corps Intelligence Agency, Coast Guard Intelligence Agency, Defense Intelligence Agency, Central Intelligence Agency, Department of Energy, Department of Homeland Security, Department of State, Department of the Treasury, Drug Enforcement Administration, Federal Bureau of Investigation, National Security Agency, National Reconnaissance Office, and my personal favorite, The National Geospatial-Intelligence Agency. These sixteen all fall under the Office of the Director of National Intelligence. The Air Force Intelligence Agency alone deploys 50,000 military and civilian intelligence personnel. I was one of those at one time when I served in Air Force Intelligence. You who know me can make your own judgments or trite jokes. Each of these agencies has subdivisions. For example, the Army Intelligence Agency contains five more “major” military disciplines within its overall functions: Imagery Intelligence; Signal Intelligence; Human Intelligence (yeah, I wondered too); Measurement and Signature Intelligence; and Counterintelligence and Security. I will leave it up to you, Gentle Reader, to analyze the meaning behind President-Elect Trump’s rejection of the “intelligence” of the groups that gave us “Weapons of Mass Destruction”. As for me, I am transfixed by the notion that America has all these agencies containing hundreds of thousands of people whose job it is to spy on someone. My concern is who? There are only a few folks such as Russia, China and, an assortment of enemies our intelligence agencies created for us by surreptitiously toppling their governments, who might actually need watching. What about the other 5 billion people on the planet, especially the 330 million Americans? All those thousands of spies have to either spy on somebody or get jobs, judging maybe. I fear our firewall against foreign enemies might turn inward out of boredom or partisanship. But after years of having our country insert itself in places such as Cuba, Viet Nam, Iraq, Afghanistan, Syria, etc., etc., my real fear is eventually our intelligence manipulators will get us into a hole even the most powerful country in history cannot claw its way out of. Usually Peg is the only one who reads these articles. However, I feel as if someone will be peering over her shoulder this time. Oh well, it will probably be some of the same disingenuous spooks who have tried repeatedly and unsuccessfully (so far) to get us to bomb Iran; so there is probably no need for us to worry.